The 2019 launch of Iliad Catamarans, an exciting new line of power catamarans, heralds a revolutionary new chapter in the multihull industry. Iliad Catamarans are stunning achievements in power catamaran design, delivering safe and comfortable offshore performance with some of the longest range capabilities in their market segment (2000nm-6000nm). 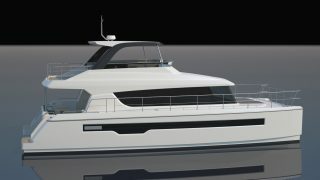 The catamarans are particularly unique in that clients are able to customise many aspects of their chosen model during the build process to reflect their individual style and needs, but without the epic cost of most production power catamarans. The Iliad Catamarans range comprises the Iliad 50, 60, 70 and 90, with each model allowing clients to choose their own preferred layout, timber finishes, electronics package, luxurious fabrics, engine options and more, at a cost-efficient rate. Just like the legendary Achaean ships of Homer’s epic poem, Iliad Catamarans are designed to face the most treacherous conditions with confidence. The product of years of rigorous research and development, Iliad Catamarans boast the design expertise of renowned naval architect Riccardo Bulgarelli who worked in Italy for many years for some of the world’s leading shipyards before establishing his own design office in China. Bulgarelli has successfully designed and project-managed the build of many exclusive custom vessels as large as 112ft for export to the world market. Iliad has designed each model to evoke the comfort and style of luxury apartments, with astonishing space throughout their living areas. Conceptualised with long-term cruisers in mind, the cats are extremely functional with excellent flow across the various zones. The standard forward lounge in each model provides amazing 360-degree views, and unlike many other modern power cats, Iliad has introduced an option for a spacious master suite in the main deck to optimise the use of space and create a naturally light, airy and idyllic retreat. Beautifully appointed gourmet galleys are standard across the Iliad range, complete with the best quality Seimans appliances and rangehood extractor fans. Every cupboard is thoughtfully accessible for guests of all heights, and storage facilities are in abundance for extended cruising. As with the rest of the boat, the galley can be completely customised to add or remove any fixtures or styles the buyer desires. Continuing this freedom of choice, the flybridges can be left entirely open or can be fully enclosed with fully ducted air conditioning, or owners can elect to have the best of both worlds with high-quality clears that can be opened and closed as the elements demand. ​Wide, safe walkways are part of each design with hand rails at a comfortable height for complete security at sea, while clear, uncluttered decks and huge deck storage facilities make offshore passages practical, safe and carefree. Iliad Catamarans have been designed to tackle the most rigorous conditions with confidence. Ideal for extended-passage cruisers, each model affords impressive range and speed with competitive fuel efficiency. Iliad Catamarans’ standard recommended engines deliver a long-range cruising speed of around seven knots at a fuel burn of less than 1.5 litre per nautical mile with a range of up to 6000 nautical miles (depending on model). ​Well-trimmed fore and aft at all speeds, the cats are able to explore farther than their competitors with the protective grounding skegs making them beachable. The catamarans’ hulls and high bridgedecks have been designed to facilitate a smooth ride in the toughest offshore conditions, making the Iliad range a true blue-water option that will challenge the loyalties of the most passionate monohull cruisers. While the ability to truly customise each model is a major feature of the Iliad range, the 50, 60, 70 and 90 are also a remarkable achievements in power catamaran design. ​Iliad Catamarans are true long-range power boats that make no compromises, and each cat has been designed with an emphasis on safety, strength, stability and economy. The finest minds in naval architecture have been employed to ensure each Iliad delivers outstanding performance in the most rugged conditions. Over ten engine options are available, and Iliad Catamarans all come with standard inclusions, including dual control electronics as well as systems for fuel transfer, blackwater and power management systems (minimum 5000W inverter). Each model also features flybridge hard tops, foam core hull and decks (vinylester resin hulls), Tecma electric toilets, bathroom extractor fans in bathrooms and an ocean of other premium-quality fixtures. ​Every Iliad Catamaran is constructed to comply with all specified international survey regulations, and for maximum peace of mind also includes a five-year internationally supported structural warranty.